Step 3: Select some music. Step 4: Press the "Play" button in the control bar at the top of TouchCopy to play your selcted music in order. Step 5: Press the "Pause" to stop the playback, or "Next" to skip the currect track. 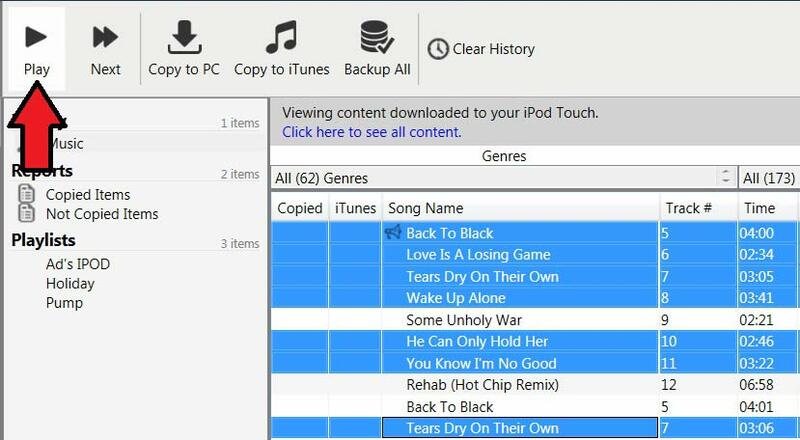 TouchCopy can play your music directly off your iPod or iOS device through your computer. Once you have made your song selections pressing the play button will play all of your selected songs in order. Alternatively, double-clicking a song in the song list will play that song and any subsequent songs in the list. You may continue to browse your music library and perform other operations (i.e. copy / transfer, search) while your music is playing. Pause your playback by hitting the Pause button, resume play by hitting the play button again. You may skip to the next track in your selection by hitting the Next button. The volume at which the music is played back can be set in TouchCopy Options. Occasionally, a music file on your iPod may not play. Your iPod will skip over such a track until it finds one in the play sequence that it can play. Also, occasionally you may find that none of your DRM protected music will play on your iPod - your iPod will also skip those tracks also. TouchCopy follows this same behaviour. If TouchCopy detects a track that your iPod will skip playing then it will mark the track with a icon - TouchCopy will then skip to the next track. n order to fix a corrupted music file on your iPod you will have to re-write that file back onto the iPod from iTunes. If your iPod is skipping all your DRM protected music you will need to re-sync your iPod to iTunes once your iTunes has been authorized with your iTunes music store account. Music that is failing to play in TouchCopy will be added to the TouchCopy "Failed to play" Log. See Error Logs for further details.